Here's a cool idea...invisible speakers. Yes, invisible. Emo Labs has developed a revolutionary new technology that turns a TV screen (or a computer screen) into an actual speaker. Instead of the sound emerging from regular speakers like we're used to, it actually comes right out of the screen itself. The technology is called "Edge Motion," and how it works is pretty darn impressive. A very thin, clear membrane (the actual speaker) is embedded on the TV screen. A thin piezo actuator inside moves back and forth against the membrane and microflexes it, thus, creating the sound. The end result is excellent sound quality without having to have speakers that take up valuable space. And this is good news since products like flatscreen TVs and laptops keep getting thinner and thinner. With a technology like Emo Labs' Edge Motion speaker system, manufacturers won't have to worry about where to fit the speakers. The speakers will be right in the screen itself. Cool. 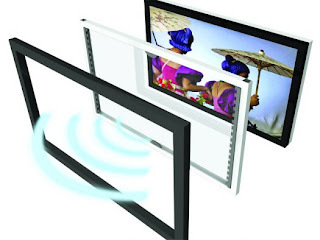 Emo Labs' Edge Motion speaker systems can be used in a variety of consumer electronics, such as: Flatscreen TV's, laptops, digital photo frames, gaming consoles, PDAs, portable DVDs, GPS units and more. Here are two video demos with Jason Carlson, the CEO of Emo Labs, showing how this new audio technology works. The videos were taken at the DEMO 2009 conference in San Diego, California.